The 32nd Ward’s Scott Waguespack is a good guy, and he’s one of Chicago’s best aldermen. A key independent voice and reformer, he’s sort of the Eliot Ness of City Council. He made headlines for leading the opposition to Richard M. Daley’s much-hated parking-meter contract, as well as Rahm Emanuel’s fishy reboot of the deal. Waguespack is generally a strong supporter of sustainable transportation, and he bike commutes regularly—he’s been doored or struck by cars on multiple occasions. It’s a bummer when a politician you respect is on the wrong side of an issue you care about. So I was distressed to read quotes from the alderman that seemed critical of Chicago Department of Transportation initiatives that convert car parking spaces to productive uses like Divvy bike-share stations, on-street bike racks and “People Spots” seating areas. “Bike shares, People Spots … what will that do to businesses?” he asked at a community event this spring. In early July Waguespack voiced concern over a proposal to swap car spaces for a new People Spot in front of Dimo’s Pizza, 1615 North Damen in Bucktown. “Loss of parking is huge. Everyone wants more. And this removes two [spaces],” he told DNAinfo. These comments suggested that the alderman hadn’t grasped the concept that it’s far more important to bring customers to a retail strip than it is to bring automobiles. I recently talked to Waguespack’s chief of staff, Paul Sajovec, who clarified the alderman’s position on parking-space conversions. 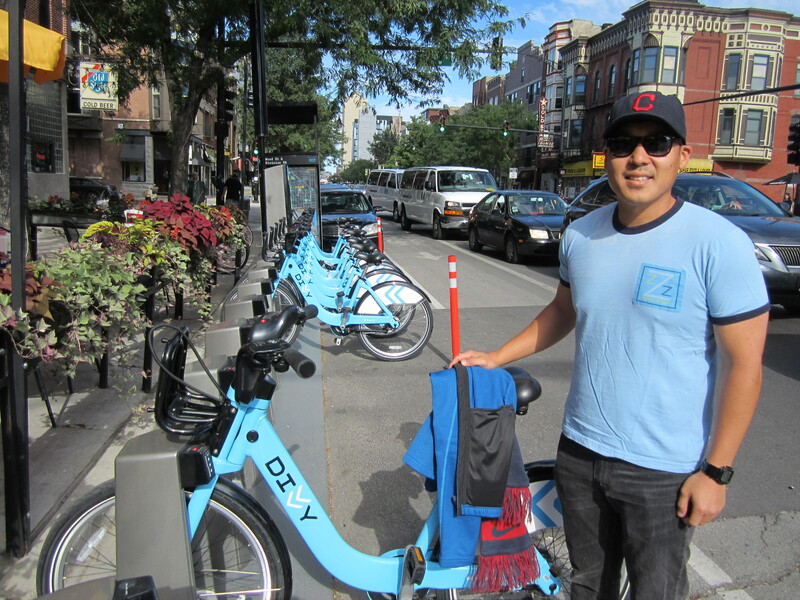 “With Divvy stations, our goal in working with CDOT was to have a maximum number of stations in the ward with a minimum amount of parking spaces removed,” Sajovec said. The ward was generally able to work with the transportation department to find station locations that didn’t require parking conversions. It’s worth noting that Waguespack’s district is home to Chicago’s first People Spot, next to Heritage Bicycles, 2959 North Lincoln in Lakeview. Sajovec said the Bucktown People Spot is probably going to be approved as well, and the alderman is currently OK with trading car spots for seating areas, as long as it doesn’t require exporting metered spaces to other neighborhoods. Last week at a council meeting, the alderman rightfully blasted the mayor for spending $55 million in tax-increment-financing to help bankroll a new DePaul basketball stadium while laying off some 3,000 Chicago Public School staffers due to budget shortfalls. However, I was annoyed that the alderman also mentioned Divvy as a dubious use of TIF dollars. First of all, the TIF money spent on the bike-share system, a useful transportation program, mostly bankrolled by federal grants, which will serve a huge swath of the city, will be less than a tenth of that squandered on the basketball boondoggle. Secondly, it’s disingenuous of Waguespack to request a maximum number of Divvy stations in his ward and then kvetch about the funding. I vented to a CDOT staff member about the alderman’s recent Divvy dig, as well as his previous gripes about parking conversions. The staffer mentioned that the station in front of Wicker Park’s Smoke Daddy barbecue joint, 1804 West Division in the 32nd Ward, displaced two car spots, and it’s now getting used an average of sixty times a day by bike-share customers. When I tweeted this factoid to Waguespack, he was underwhelmed. He responded that giving away public space is an issue that aldermen and the city need to take seriously, which is why he’s cautious about parking conversions. That’s true, I replied, but while the conventional wisdom says that using the public right-of-way to warehouse private automobiles is the best way to bring shoppers to a retail district, often that’s not the case. The alderman responded by daring me to prove the Smoke Daddy Divvy station is more useful than the two car parking spaces it replaced. Challenge accepted. Last Wednesday I hung out in front of the rib shack for two hours during the evening rush and talked to folks who were checking out and docking the cycles. The entire 1800 block of Division is unmetered, so installing the station didn’t require creating new metered spaces elsewhere. During the stakeout, I also kept a close eye on the two car spaces just west of the station to see how many customers they were bringing to the strip. When I started my vigil at 4:30pm, a black Volvo station wagon and a turquoise Jeep Wrangler occupied the spots. Richard Hurh, who works for LinkedIn, rode Divvy home from downtown to a station by his apartment at Beach and Wood, changed clothes, grabbed another bike and pedaled to the Smoke Daddy. From there he was going to stroll a few blocks to watch a soccer match at the Small Bar. “I could have walked the whole way from my house but it was nice and convenient to take a Divvy,” he said. Rob Bloom, a Humboldt Park resident who works for an organic mushroom farm, had been sightseeing by Divvy with his friend Amanda Burton, a social worker visiting from Tucson. “We’ve been using it to go different places instead of walking, covering a little more ground, just for fun,” he said. As I buttonholed the bike-share customers, some interesting patterns emerged. The majority of them had ridden home from work in the Loop. Most of the users worked in technology or finance. All but Burton were male. In total, twelve different people used the Smoke Daddy Divvy station during the two hours I held court. True, it was rush hour on a gorgeous day with ideal conditions for cycling. On the other hand, the station is probably even busier on weekends, when more folks are using the bikes for running errands and pedaling to restaurants and bars on the Division Street drag. In contrast to the high Divvy turnover, two hours later the parking spaces were still occupied by the same Volvo and Jeep. While most of the bike-share customers weren’t necessarily spending money on Division, it’s safe to say the two spots used for the busy station were more productive than the two inert parking spaces. So, Scott, what do you think is a better use of public space now—accommodating a couple of cars or a dozen Divvy riders?